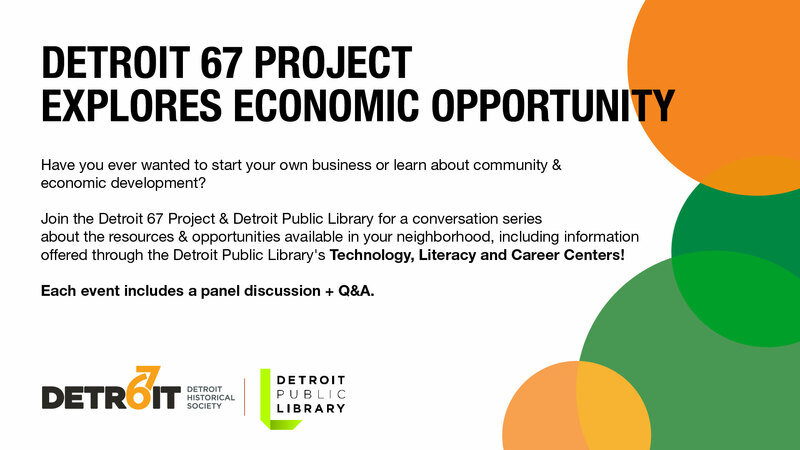 This summer and fall, we’re excited to partner with the Detroit Public Library to host a series of economic empowerment conversations at library branch locations around the city. The panel series will feature a mix of local business owners from the surrounding neighborhoods as well entrepreneurship support services (ranging from financial institutions, to training programs, classes, and etc.). The topic of economic inclusion and opportunity is one of the Detroit 67 Project’s critical imperatives. As we shift our focus from reflecting on the 50th anniversary of 1967 to how Detroiters are participating in the city’s present and future growth, our intention is to reach Detroiters where they are. We’re looking forward to utilizing the library branches as community meeting spaces, aligning the presentations with services provided by the Detroit Public Library’s Technology, Literacy and Career Center, and expanding our presence outside of Midtown. Thursday, July 26, 6 – 7:30 pm: Chandler Park Branch. Featured panelists: FoodLab Detroit, Eastside Community Network, Build Institute. Wednesday, August 8, 6 – 7:30 pm: Redford Branch. Featured panelists: Sweet Potato Sensations, Build Institute, Detroit Development Fund. Thursday, September 6, 6 – 7:30 pm: Duffield Branch. Featured panelists: Coalition on Temporary Shelter, Women Who Weld, Karasi Development Group, Detroit Community Wealth Fund. Wednesday, September 19, 6 – 7:30 pm: Parkman Branch. Featured panelists: ProsperUS, Karasi Development Group, Detroit Training Center, Rebel Nell. Wednesday, October 10, 6 – 7:30 pm: Knapp Branch. Featured panelists: Recovery Park, Build Institute, Detroit Development Fund. For full details, visit our events calendar.